Who's on the firespiral train?! I may be late to get on this, but wth the arrival of copper octarine winter hill, I'm wondering what other glories I'm missing! Light on hand (245gsm) and big on bounce (50/50 hemp/cotton) with a plush, silky texture, this FiSpi is just a bit special. The colors pretty much glow. Dark, rich violet-toned navy contrasted with a luminous coppery red, and while I've never been draped this is the kind of wrap that makes me wish I knew a bit more about color theory. The jacquard weave is flattish and offers a nice amount of grip - enough to hold second passes nicely, but not enough that getting them spread is difficult. Hemp is like a heavenly cloud of cush on the shoulders and forgives sloppy wrap jobs (phew!). 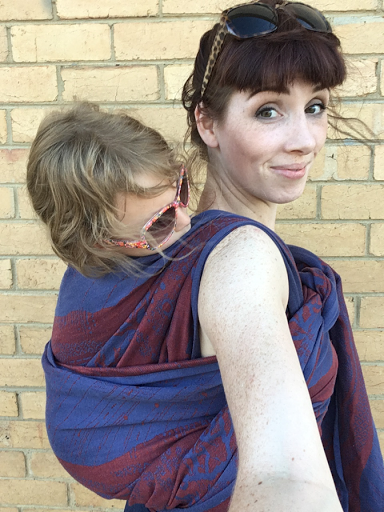 I never needed to retighten (I tend to wrap hemp reallllllly snugly, as it is a bit elastic) and the support of this wrap was just astounding for it's weight. 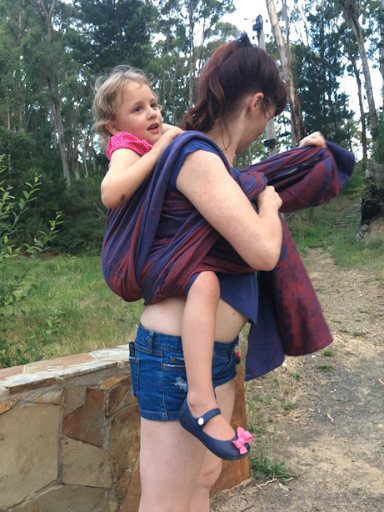 This has worked beautifully for us on a variety of carries - a quick ruck heading uphill from the lake, a double hammock that needed to finish a hike, and even a fwcc (no mean feat with 18kgs!) when sleep eluded us in a new house one night. 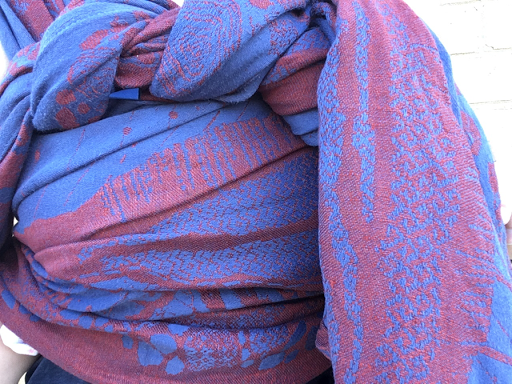 I can't speak to the breaking-in of the great hemp, since this came to me after testers, but persevering with your hemp (heat, ironing, twisting and hammocking!) is DEFINITELY worth it! Congrats, Firespiral. Winter hill is glorious and we love it.